Ash Cottage in Tideswell sleeps 4 people. 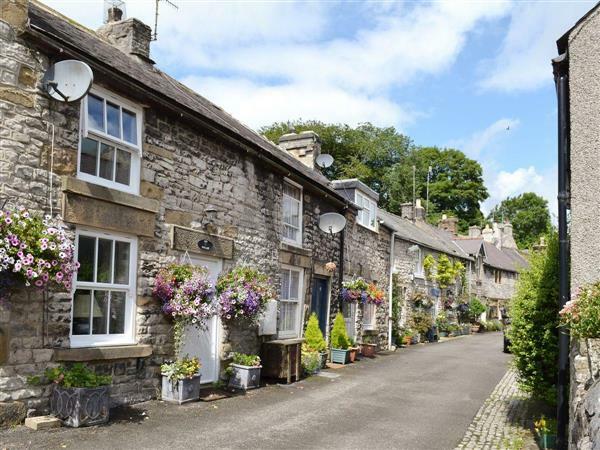 This delightful, spacious, terraced holiday cottage sits in the centre of Tideswell, the cathedral in the Peaks, with excellent walks from the doorstep, cycle trails, climbing nearby and watersports at the beautiful Carsington Water. The surrounding pretty villages and the towns of Bakewell and Buxton are only a short drive away. Visit the lovely stately homes such as the famous Chatsworth House and its gardens and the medieval Haddon Hall. Take the cable car from Matlock Bath and visit The Heights of Abraham or the nearby village of Eyam. Shop 100 yards, pub and restaurant 75 yards. Ground floor: Living room with beams and stone floor. Dining room/kitchen with quarry tiled floor. First floor: 2 double bedrooms, one (zip and link). Bathroom with shower over bath and toilet. Woodburner in living room (initial fuel included). Gas central heating, electric and bed linen included. Freeview TV. DVD. CD. Electric cooker. Microwave. Washing machine. Fridge/Freezer. Small enclosed garden and furniture. Car park (30 yards). No smoking. Holidays run from Friday to Friday. NB: 6 steps in garden. For a better idea of where Ash Cottage is, you can see Ash Cottage on the map below. Ash Cottage is in Derbyshire; should you be on the lookout for a special offer, you can find all the special offers in Derbyshire. It's always worth checking to see what is on offer at the moment. Do you want to holiday near Ash Cottage (25494), you can see other cottages within 25 miles of Ash Cottage; have a look to find your perfect holiday location.